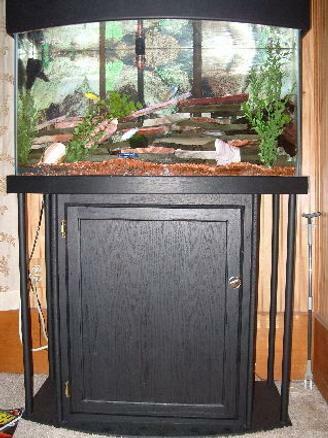 Description: This is a 46 gallon bow front tank with custom made base and canopy made by myself. Lighting is made by Coralife and it is two 36" white t5 (65w total) bulbs and two 36" blue t5 (65w total) bulbs hung under the canopy. 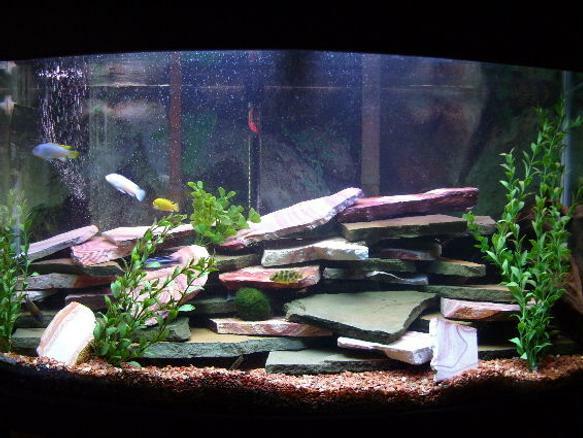 Filtration is one Aqua clear 70 and one whisper 40 hung on the back. I have one power head running for air flow and water movement. Rocks are rainbow slate and flat sandstone. Advice: Do your homework and know what you are getting into before you do it. Read and research a lot. Take your time.